On the 16th November, the highly anticipated Build My Future Festival took place in Liverpool’s Baltic Triangle. Collaborating with local communities and prestigious city-wide businesses, the event accommodated over 300 sixth form pupils from across Northern Schools Trust. The dynamic two day stint offered a wealth of career inspiration from industry experts, and focused on how to prepare for working life, whether that be in the form of university, apprenticeships or employment. Professional guidance leader Andy McCann kicked off the event’s launch in Camp and Furnace by introducing the year 12 cohort to this year’s keynote speakers. Wirral South MP Alison McGovern took to the stage first, delving into the subjects of bravery, rebellion and fear: “We must welcome failure in order to succeed. Don’t be afraid to fail initially. There’s lots to learn from it” she remarked. Liam Kelly was up next. As a social entrepreneur and founder of Make Liverpool, Liam recalled his own personal journey and imparted the best snippets of advice he had learnt along the way. With the students gripped, he touched on the importance of asking for help, how you can use mistakes as a tool to progress, and finally, the need for men to champion women in society going forward. Closing the keynotes was creator of The Anfield Wrap, Neil Atkinson. Self-confessedly living his dream job, the emphasis for Neil was on the opportunity for students to build their futures. “Over time, what you like is sure to change, but bound in, learn as much as you can and grab every opportunity that is presented to you over the next two days” he urged. The afternoon saw students divided into their relevant pathways and in addition, the programme for the day featured visits to high-profile businesses and industries including UCLAN, LIPA, Liverpool University, Shop Direct, The museum of science and industry and automotive industry giants Jaguar Land Rover to name but a few. Day two of the Build My Future Festival saw a morning of interactive talks tailored to the student’s professional pathways of choice, including expert sessions from the likes of AstraZeneca and UK Cat. The remainder of the day continued to ramp up, from working lunches with health professionals, to immersive 3D biology inflatable dome experiences and even puppetry workshops for the creative pathway students. Closing the Festival, organisers were delighted to welcome award-winning hip-hop storyteller and poet Alim Kamara. As a firm believer that young people must embrace their individuality and celebrate such within each other, Alim reiterated that each and every one of us hold the ability to reach our goals. “Success is not by magic, it’s by work!” the room chanted. Delivering an electric session with tonnes of energy, he encouraged the cohort to be “students of life” as there is always something to learn from every experience. 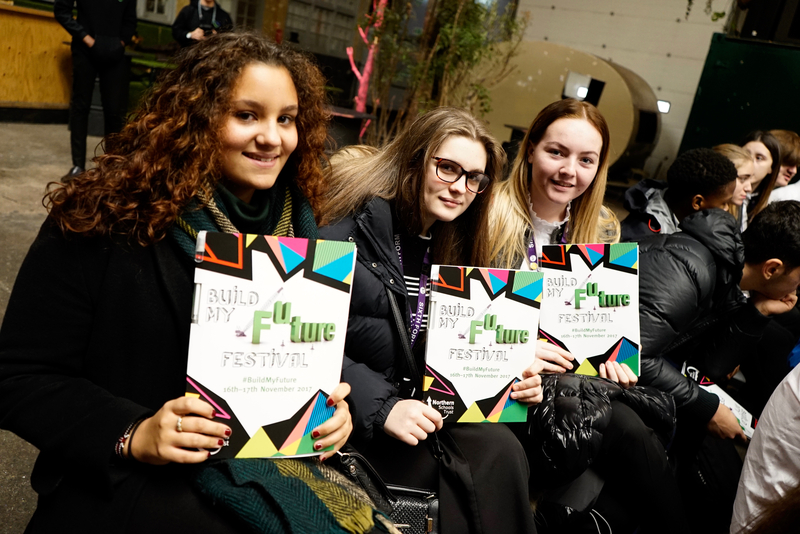 The Build My Future Festival encompassed 60 companies and over 300 students across 2 days, with 1 clear goal:- to inspire its young people to go out into the working world and achieve their true potential. A massive thank you to all involved in this year’s event including guest speakers, business partners and the Build My Future Team for making it an event to remember.